Naomi Kayayan, BMus (Hons), GRNCM, PGDip (Dist), MA (Dist), FRSA, divides her time between working in the UK and S.E Asia. She is currently based at Wycombe Abbey International School in China where she is Head of Keyboard. In addition to leading the 200 strong keyboard department at Wycombe Abbey, Naomi mentors new staff and takes a lead role in staff recruitment and training. She is also the key liaison for developing partnerships between the School and Conservatoires in the UK. In addition to her role at Wycombe Abbey, Naomi also works extensively for ABRSM. In 2005, she was the youngest ever female to be appointed to the examining panel in its 125 year history. Since this time Naomi has examined throughout China, Hong Kong, Singapore, Malaysia and Taiwan. Her commitments to ABRSM also extend to examining jazz and diploma exams, as well as the traditional grades, and, for several years, Naomi was on the panel of ABRSM professional development mentors, working with Bill Thomson and Richard Crozier on the CTABRSM, DipABRSM teaching diploma and ‘Teaching Music Effectively’ courses to piano teachers from all over the UK and South East Asia. Before moving to China, Naomi was a tutor in the faculty of Keyboard Studies at the Royal Northern College of Music and Junior RNCM, where she taught for 17 years and is still a frequent visiting tutor. Naomi’s career in the UK also extended to maintaining a thriving private teaching practice. 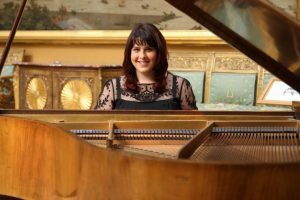 She has held roles on the piano faculties of a number of prestigious schools including Chetham’s, Sedbergh and Withington, and, has held the position of Director of Music at three independent schools. Her students frequently go on to study at conservatoires in different corners of the globe and develop successful careers in the music industry. Naomi obtained her degrees from the Royal Northern College of Music and subsequently as a researcher in music psychology and education at the University of Reading, where she was awarded a Distinction for her MA. In 2018 Naomi became a Fellow of the Royal Society of Arts in recognition of her contributions to music education and international relations. As an advocate for life-long learning, Naomi is also preparing for the FHEA route postgraduate course in performance pedagogy alongside qualifications in mentoring and leadership at the Guildhall School of Music and Drama in London. Naomi is an experienced soloist, accompanist and chamber musician. She has given live broadcasts for BBC Radio and has been involved in two recording projects: one on the music of Armenia, the origins of her family roots and a second ongoing project on Hispanic piano music. She also works regularly with internationally acclaimed Mezzo-Soprano, YCAT and Radio 3 New Generation Artist, Kathryn Rudge, with whom she has given a number of recitals. In her spare time, Naomi maintains an interest in travel and languages. She is currently learning Mandarin and Spanish and she is a fluent French speaker. Naomi is an enthusiast of all things Hispanic, not least the music. In recent years she has travelled all around South America and her next venture will be to visit Cuba and complete the pilgrimage to Santiago de Compostela in Northern Spain. Naomi is delighted to be working with the ESTA team in the delivery of its courses, and, to support and inspire instrumental teachers the world over.